Russell Finex participated in the 20th edition of CFIA where they presented a range of separation and filtration equipment. The food processing industry is one of the biggest industries in France and is still growing, resulting in another record year for the CFIA exhibition. CFIA 2016 set a new record with 1450 exhibitioners and over 19,000 visitors attending the show, confirming its status as the largest gathering of manufacturers and innovators in the food processing industry. The entire sector was invited to discover the latest high-quality technologies, targeting technicians, production managers, operators, sales professionals, marketing and R&D. As the CFIA exhibition emphasizes the importance of innovation, Russell Finex was proud to exhibit their latest filtration and separation solutions. Russell Finex has over 80 years of experience in separation, sieving and filtration solutions, offering their expertise to many companies within the food processing industry. 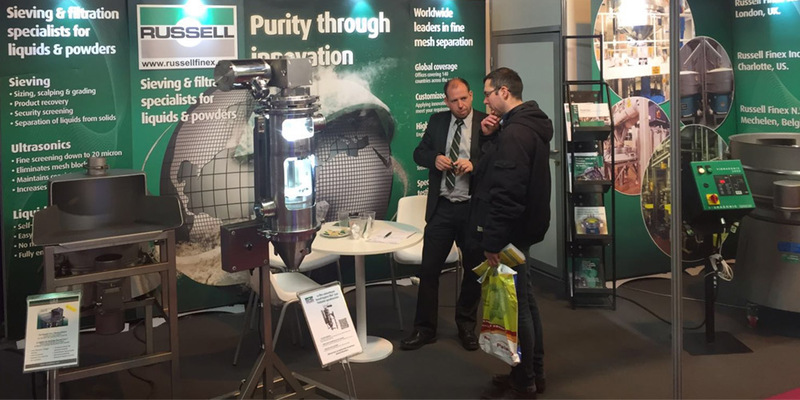 During the show Russell Finex presented the Russell Hygiene Filter™, the Russell Compact 3in1 Sieve™ and the Finex Separator™. Read the CFIA show preview for detailed information on the machines presented. Didn’t get a chance to visit Russell Finex at CFIA 2016? The next shows Russell Finex will be exhibiting, are Powtech in Nürnberg, Germany and Pumps & Valves in Antwerp, Belgium, both taking place in April. If you want to learn more about the range of sieving and filtration solutions offered, please check out one of our product videos or contact us.